Localized molecular orbitals, such as Natural Bonding Orbitals (NBO) or Natural Localized Molecular Orbitals (NLMO) can be helpful in analyzing and interpreting properties computed in electronic structure calculations. This tutorial analyses the effects of NH2 and NO2 substituents in ortho-, meta-, and para-positions on NMR chemical shifts of aromatic carbon atoms in a benzene ring. These shifts in aromatic systems are commonly believed to originate from a depletion or accumulation of electrons in the π-orbitals at these atoms. 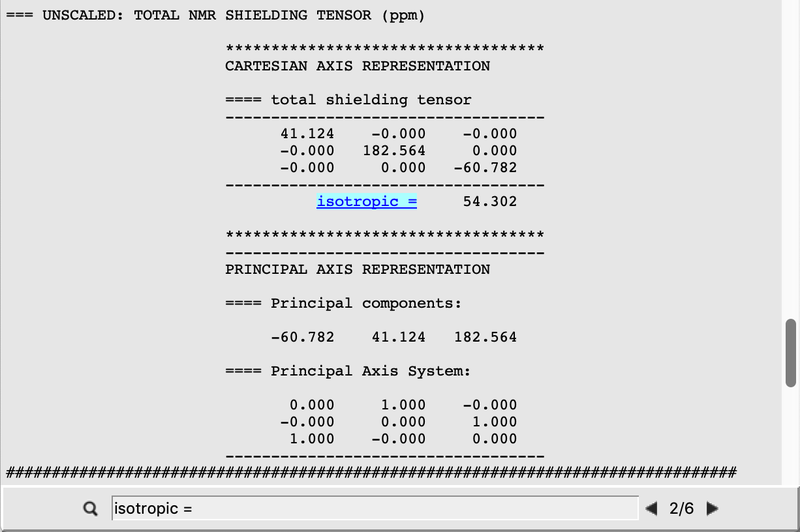 We examine this claim by means of NMR calculations with ADF and NBO/NLMO analysis tools. This tutorial loosely follows the following publication: R. V. Viesser, L. C. Ducati, C. F. Tormena and J. Autschbach The unexpected roles of σ and π orbitals in electron donor and acceptor group effects on the 13C NMR chemical shifts in substituted benzenes, Chem. Sci. Phys. 8, 6570-6576 (2017). These structures have already been optimized and properly aligned. In general, you should optimize the structures first. The analysis of NMR and EFG results in terms of localized molecular orbitals requires some care about the alignment of the molecules when comparing results between different systems as in our case. This is, for example, because the analysis in terms of NLMOs is origin dependent. To obtain comparable orbital contributions one has furthermore to ensure that the different molecules are oriented in the same way. In ADFInput you can use the options Edit → Align and Edit → Set Origin to achieve this when performing localized orbital analysis with your custom models. We need to perform three ADF calculations, one for each molecule (i.e. Benzene, Aniline, and Nitrobenzene). An all-electron basis set is needed because a hybrid functional is used. Using an all-electron basis set also improves the quality of the NMR results. A scalar relativistic treatment (Relativity → Scalar) is required to perform the NBO analysis of the NMR shifts. In the case of Benzene the atoms C(1), C(4), and C(5) are all equivalent, thus yielding shielding constants σi of the same value. This is different in the case of the other two systems, whose shielding constants are retrieved analogously from the corresponding output files. The experimental NMR shifts are reproduced with an error margin of about 2 ppm, and the trend between the different substitutions is reproduced: the NH2 group leads to a significant decrease in the chemical shifts in ortho- and para- position. The meta-position remains almost unaffected by the NH2 group. This is also observed for the meta-position near a NO2 substitution, while the chemical shifts are lowered at the ortho-atom and increased at the para-position. To rationalize this finding, we proceed to examine the contributions of individual orbitals to these substituent effects. 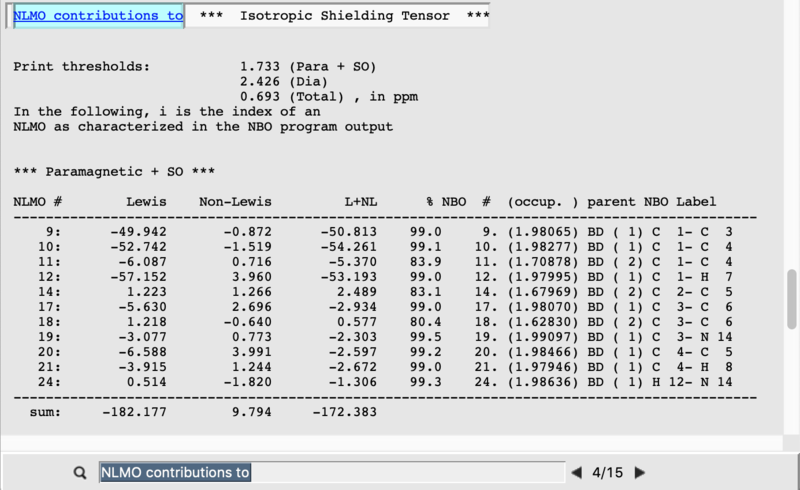 We first look at the individual NLMO contributions to the isotropic shielding tensors. Each output file contains the NLMO and NBO decomposition of the isotropic shielding tensors (and other quantities) for the atoms C(1), C(4), and C(5). The NMR shielding tensors consist of diamagnetic and paramagnetic (+SO) contributions. Diamagnetic terms are larger but mostly dominated by contributions from core orbitals and they essentially not affected by the local environment of an atom. As we are interested substitution effects, i.e. changing environments around an atom, we focus on the diamagnetic terms here as these are most influential on the magnitude and direction of the chemical shifts. 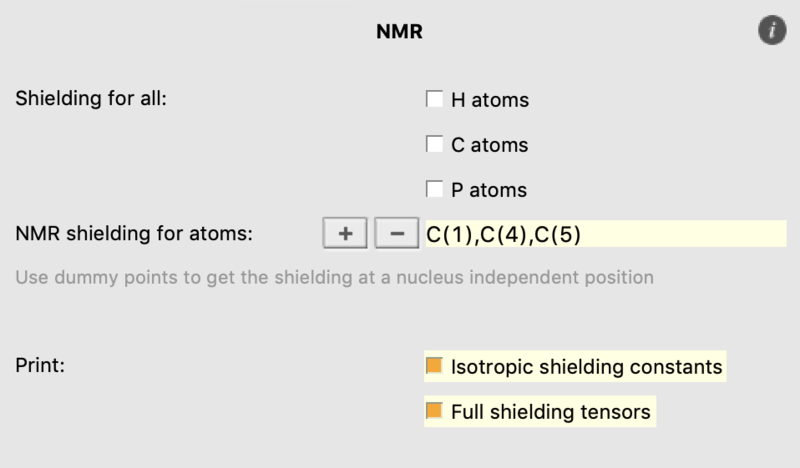 We find that the paramagnetic part of the isotropic shielding tensor at atom C(1) is mostly determined by contributions originating from three bonding NLMOs formed between C(1) and its three neighbors C(3), C(4), and H(7). Analogous results are obtained for C(4) and C(5) as well as for the corresponding atoms in the Nitrobenzene molecule. One finds similar results when examining the NBO contributions to the isotropic shielding tensors. 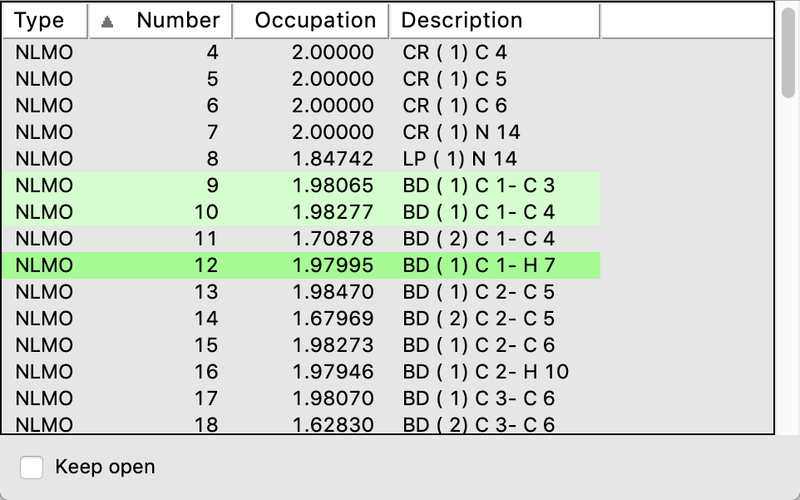 These contributions can be obtained by searching for NBO contributions to in the search bar of ADFoutput. We now examine in more detail the NLMOs with the largest contributions. In the field bar at the bottom: Select Field ... → NLMOs..
As the results discussed above show, such π-orbitals are not contributing much to the isotropic shielding tensors. In the field bar at the bottom: Select Field ... → NBOs.. 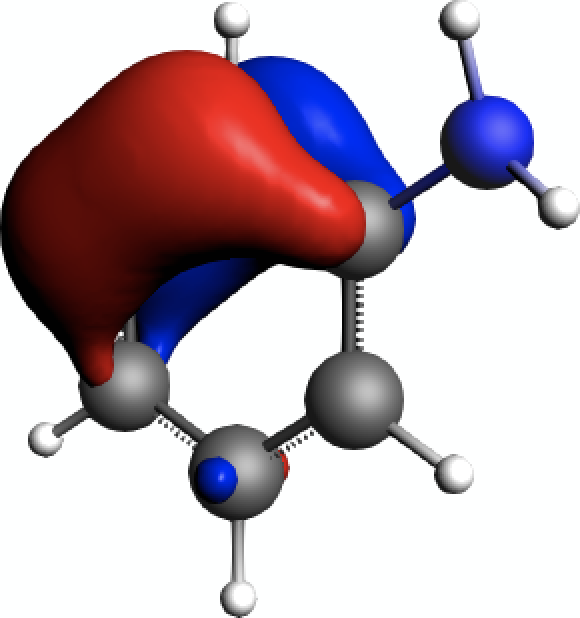 In conclusion, the chemical shifts due to substitutions on an aromatic ring are mainly influenced by contributions from σ-bonding orbitals rather than π-orbitals. R. V. Viesser, L. C. Ducati, C. F. Tormena and J. Autschbach The unexpected roles of σ and π orbitals in electron donor and acceptor group effects on the 13C NMR chemical shifts in substituted benzenes, Chem. Sci. Phys. 8, 6570-6576 (2017). J. A. Bohmann, F. Weinhold and T. C. Farrar Natural chemical shielding analysis of nuclear magnetic resonance shielding tensors from gauge-including atomic orbital calculations, J. Chem. Phys. 107, 1173-1184 (1997). J. Autschbach Analyzing NMR shielding tensors calculated with two-component relativistic methods using spin-free localized molecular orbitals, J. Chem. Phys. 128, 164112 (2008). R. V. Viesser, L. C. Ducati, C. F. Tormena and J. Autschbach The halogen effect on the 13C NMR chemical shift in substituted benzenes, Phys. Chem. Chem. Phys. 20, 11247 (2018).